Ohtani has inspired strong reactions ever since the world became aware of the Japanese star’s formidable talent as both a pitcher and a hitter. Now that the Angels have landed such a coveted prize, they can’t wait to see who else he can knock over. 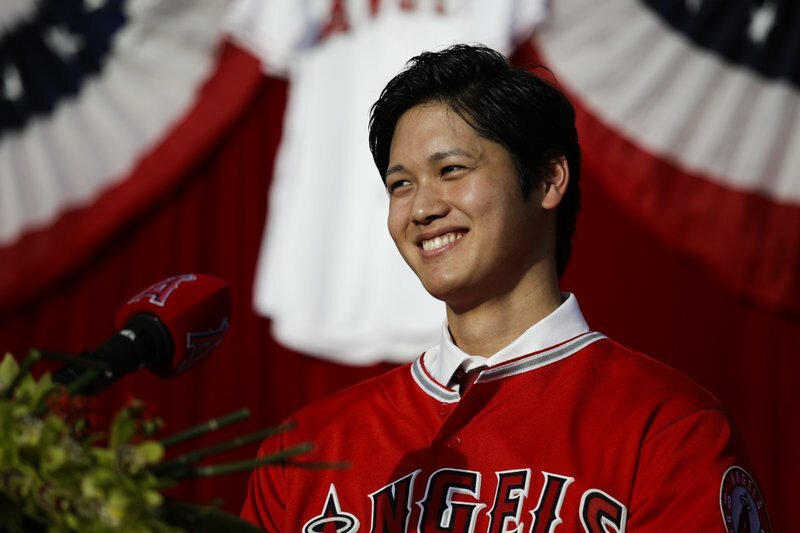 The Angels formally introduced Ohtani on Saturday, one day after the franchise won the baseball-wide competition for his services. A lively crowd gathered in front of Angel Stadium cheered when Ohtani donned a red No. 17 jersey and hat on stage with team owner Arte Moreno, manager Mike Scioscia and Eppler. Ohtani already knows how to work a crowd, too: He had the perfect answer when asked whether he was more excited to get his first pitching victory or his first homer in the big leagues. “Hopefully, if I can pull it off, maybe both in one game,” he said through a translator. Ohtani’s grand experiment with the Angels is off to an entertaining start. The league-wide courtship ended Friday with his decision to join Mike Trout and Albert Pujols in Orange County. The 23-year-old former Japanese MVP is attempting to become the majors’ most significant two-way player in several decades, and he will have every opportunity to fill two prominent roles with the Angels. Ohtani is expected to join the Angels’ starting rotation next season, and he will be their designated hitter on many days when he isn’t pitching, Scioscia said. Ohtani won’t play in the outfield “at the outset” of his career, which likely includes at least his first season in Anaheim, Eppler said. Ohtani’s decision was the culmination of years of hard work for the scouts and personnel executives led by Eppler, who has been traveling to Japan since 2013 to see Ohtani. Although Eppler felt Ohtani would be an ideal fit with the Angels, he had no idea whether Ohtani would agree. Moreno led the Angels’ presentation to Ohtani on Monday after he selected them as one of seven finalists, and they waited nervously for four days before getting the news. Ohtani didn’t reveal all of his reasons for choosing the Angels over the Mariners, Rangers, Dodgers, Cubs, Yankees, Red Sox and every other club. “I just felt a strong connection with the Angels,” Ohtani said through a translator. Ohtani took a moment during his news conference to send good wishes to the two-time MVP for his wedding. About 200 media members were on hand for Ohtani’s arrival, including dozens from Japanese news outlets. Ohtani and the Angels realize his every move will be chronicled on a daily basis with likely the same fervor around Ichiro Suzuki and Hideki Matsui in their heyday, but judging by his confident performance in his first major appearance, it’s nothing Ohtani can’t handle. 0 Response to "Angels welcome Ohtani, plot course for 2-way Japanese star"